What future Toyota cars and trucks will we see from Toyota USA? The next launch is the Lexus UX, a subcompact crossover which is presumably on the TNGA platform. The Yaris sedan, which is essentially a Mazda2 with Toyota labels (and formerly sold as the Scion iA), is going to be refreshed, with a new grille and optional LED headlights. The Yaris hatchback, which is unrelated, will have styling updates while it waits to be moved over to TNGA. Toyota, like most other automakers, is trying to move cars onto a common platform (a set of dimensions and, usually, architectures); the 2018-19 Corolla, Camry, RAV4, and Avalon are moving together onto a single platform which appears to be a major advance from the prior generation, with more money put into the suspension and chassis. Years of product-based cost-cutting are being reversed with the new generations. 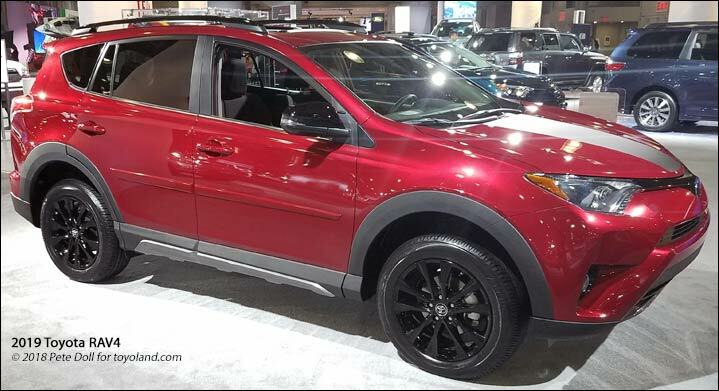 The most important of these for sales is probably the 2019 RAV4 (shown above); the 2020 RAV4 should have a hybrid version. Those who want something bigger can opt for a 2020 Highlander, which is also moving to TNGA. The 2019 Toyota Corolla has been shown, but only in hatchback form; it boasts a new 2-liter engine and a 60% increase in torsional rigidity, and the combination may well leapfrog the dated Corolla past Honda, Mazda, and other competitors. Toyota is going from worst-in-class power (identical to 1995 Neon ratings) up to 168 horses. Buyers can still get a stick-shift if they don’t want the innovative CVT+two-speed automatic combo which increases the gear range and efficiency. The Corolla sedan will stay as it is until the 2020s show up, sharing with the hatchback. The Camry and Avalon have already moved into their next generations; they have Apple CarPlay and are working on Android Auto. All wheel drive might be planned. For those who prefer extra-high-efficiency, there is the Prius range. The standard Prius and Prime are moving, is already on TNGA; the Prime is a plug-in hybrid version of the Prius. The c and v are smaller versions, which are still on an old platform, but will almost certainly move to TNGA in a few years. 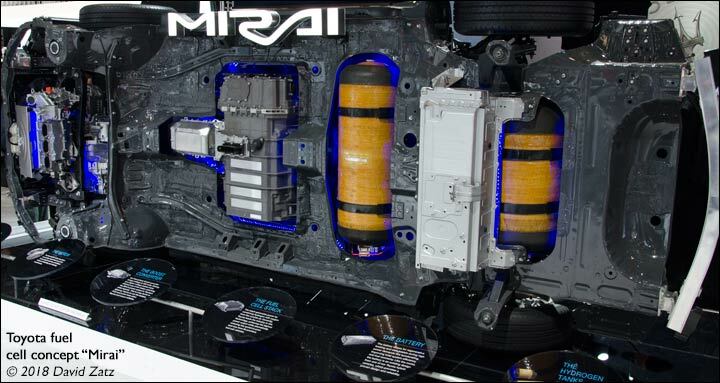 Finally, the Mirai fuel-cell car, which most people don’t know about, might be updated in the next few years despite sluggish sales. Toyota is moving into a joint venture with Mazda for United States production, and worked with Subaru, which is partly owns, on a sports car, the Toyota 86 (formerly called Scion FR-S, and also sold as Subaru BRZ) — perhaps an unfortunate name, shared with slang for rejecting or getting rid of something, and with Maxwell Smart’s code number. There’s another joint venture based sports car coming — the next-gen Toyota Supra, the result of a collaboration with BMW. A four cylinder and six cylinder are anticipated; the race version, likely not sharing parts with the production version, has already been shown. In 2009, nearly ten years ago, Akio Toyoda took control of Toyota as President and almost immediately dropped his predecessor’s plan to boost global market share, instead changing Toyota’s priorities to focus on high-quality, affordable cars. Akio Toyoda said that rapid growth had strained Toyota’s resources. Today, Toyota is, like other automakers, pushing resources into the increasingly-popular crossovers; but it has not stopped supporting cars, either. The Toyota Tundra, a true American-style full-sized pickup, was built and largely engineered in the United States. Plans for heavier duty (three-quarter or full ton) variants seem to have been dropped when sales were less than half of the projections. The big 5.7 liter V8, also used in the Lexus LX570 and the Land Cruiser, has not been substantially updated, like the Tundra itself, is overdue for an overhaul or replacement. The 4Runner, which is also body-on-frame, has dropped in popularity, and there’s a possibility it may be replaced by a more modern crossover. Finally, the Tundra-based Sequoia will continue with few changes. Finally, the Tacoma was updated in 2016 and is unlikely to see much work for another two years. The new Toyota C-HR, unsurprisingly on the TNGA base, is a subcompact coupe crossover, originally aimed at Scion. A huge seller, the Toyota Sienna minivan — America’s most reliable minivan for many years, easily beating the Honda Odyssey — will have to wait for a move to TNGA, but it’s coming in the next two to four years. The Sienna was just updated for 2018. What about Lexus? The IS and GS may be dropped, and the ES may be extended with all wheel drive and a power boost to take up where the GS left off. There will be no sub-$30,000 Lexus cars or crossovers (big surprise). A new three-row Lexus crossover is likely, and the company is looking into other crossover niches. The new ES gained a power boost and an additional two forward gears in the transmission, and moved to the capable new TNGA platform/architecture. A new F Sport package is expected to account for nearly a quarter of new Lexus ES sales. Stay tuned for extensive updates to this page.